When open, the bulk of a roller garage door is stored directly above the door. This can be an advantage; you free up a lot of internal garage space. For example, you can store more items overhead. In shorter garages, it also allows you more room as you can park closer to the door. 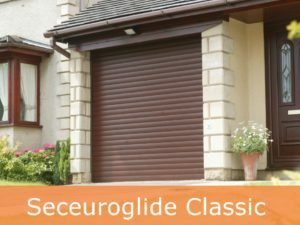 The SeceuroGlide range of roller garage doors are market leaders. They boast a unique locking mechanism and a strong extruded top slat. These make it much harder for intruders to gain access than with many other brands. In addition, each door comes with an optical safety edge, an internal manual override, and a SeceuroSense receiver. There’s also a built in courtesy light! Optional extras include an alarm system and a manually operated version of the SeceuroGlide Roller Garage Door. 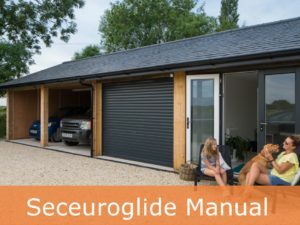 We can also provide the SeceuroGlide Connect+ for this range, allowing you to operate your door via phone call or text. This can really improve ease of use and access! A choice of sixteen paint or wood-effect finishes and over forty textured woodgrain finishes is available. The door can be powder coated to any RAL or BS colour. It’s easy to coordinate these doors with your home! 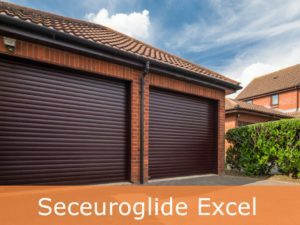 The SeceuroGlide Excel Roller Door is the first garage door which holds Police and Insurance Approval. It’s certified by the Loss Prevention Certification Board (LPCB) under the LPS 1175 burglary resistance standard. The Excel’s innovative locking mechanism automatically secures the door on closing. No more wondering if you remembered to lock it! It’s the most advanced roller door on the market – and has the highest available security specification. More information on the SeceuroGlide range, including available colour options, here.